Beautiful rug and exceeded my expectations! Brighten up your living space with this Amherst beige rug from Safavieh. This carefree floor covering features a geometric rug pattern that fits a range of decor styles, and the light, airy tones blend easily with your existing color palette. Power-loomed polypropylene construction makes this rug durable and easy to clean, and the medium-low pile is soft to the touch. For over 100 years, Safavieh has been crafting rugs of the highest quality and unmatched style. Click here to learn more. All rug sizes are approximate. Due to the differences between monitors, some rug colors may vary slightly. We always try to represent all rug colors accurately. Please refer to the text above for a description of the colors shown in the photo. Dimensions 9 ft. x 12 ft. 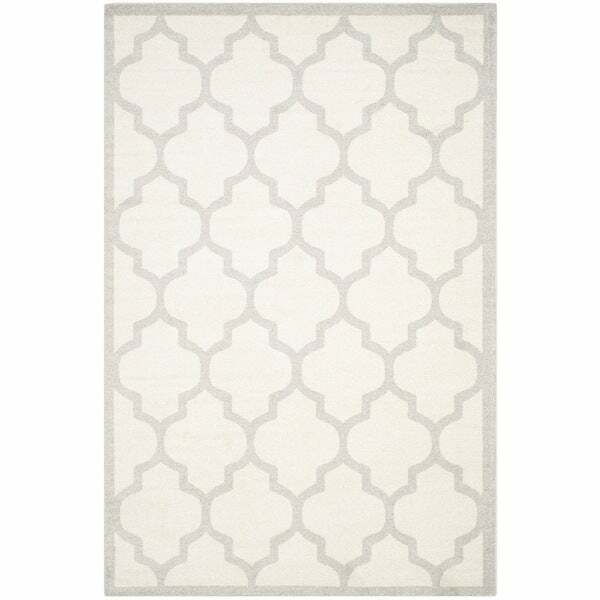 I spent lots of time looking for a neutral rug with arabesque shapes that didn't break the bank and this one fit the bill perfectly. Color is very true to the pictures, rug is pretty flat but that makes easier cleaning with a toddler, there were no foul odors, and the size is unbeatable for less than $300. Very good quality rug. Looks just like pictures. Beautiful ivory/grey rug which looks very elegant! The color looks dirty and the quality is subpar. The phrase, "what you pay is what you get", rings true here. This rug looks nothing like the picture, it is baby blue, not grey. My husband and I bought this for our sunroom and it's absolutely perfect!! Durable, yet not too stiff. Perfect for our morning room! "Is the primary color of the rug an ivory or a beige?" Edie Black and White Bohemian Area Rug - 5'3 x 7'6' - 5'3" x 7'6"